Friday 1st. Record-breaking heat had our friends the swallows slowing down a lot. It was striking to see them standing almost still, on the wire and notice again how different their shape is from that of other birds. Saturday 2nd. Some neighbours agree that birdsong before dawn has grown to sounding a bit as though it’s from some place exotic to us. Might be birds that have lost their habitat elsewhere. Early in the spring I saw one species new to me. Sunday 3rd. Corpus Christi is low-key here, compared to some places; but in any key it is one of the most heart-warming days of the year. Brother Henry was by. We talked at the lunch table, and conversation went from Magnetic Hill in Moncton to Ferris Wheels in New Jersey, to roller coasters in Toronto. Father Roger once rode ‘the Flyer’, the CNE’s famous (around here, at least) wooden-frame roller coaster. Monday 4th. New crosses were trundled out to the cemetery; looking good on the little wagon. Looking a little ominous once taken down, perched behind the crosses they’ll be replacing. It is not hard to imagine some gruff monks we knew and loved smiling with humor at it all. Tuesday 5th. Brother Léo reported a good night’s sleep last night. Dom Innocent is continuing to organise his new office; a new printer is on the way. Each successive superior uses the office their way, personalising it in the process. Wednesday 6th. 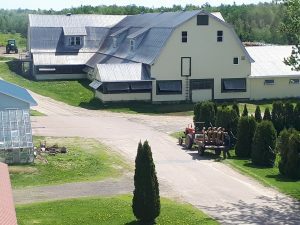 Chicks arrived in the chicken barns Monday, and today a pipe leaked in the big barn; so once it was stopped some of the bedding had to be removed, and fresh bedding brought in: fine shavings from a sawmill. Fresh feed was put out. It went smoothly but was a gradual process which our employees handled with great patience. The chicken feed, starting out, is very fine grains, looking nearly like sand. Thursday 7th. As Dom Innocent read from the Prologue to the Rule in Chapter this morning, it was striking to hear it again, Benedict’s beautiful thoughts as read by a new superior. At Mass, a Priest was by who writes a weekly column in new Brunswick’s one French-language daily. Friday, 8th. A spider was hanging tough in the top pane of the kitchen window, in the basement, this morning. Such confidence! Behind him or her, some greenery, a lovely sky. But not every spider is as content. The spider community is not happy with what has been going on in our former dairy barn; pressure washing. Hard to imagine spiders more at home than they were, there. They were peppy decorators. Saturday 9th. In the Sacristy this morning, there was a trace of incense aroma left from yesterday’s Solemnity. An old friend reappeared for the Offices. Part of our prayer, part of God’s secret is with them and so having folks back, or away, teaches us something. In Moncton, Brother Henry’s baseball cap seemed to go missing briefly today. Another nurse went in to look—there it was, on the desk. Sunday 10th. At Mass, there was a real variety of faces. At Compline, one fellow who had been at Mass re-appeared. At night we are, some of us, firing up our little electric heaters. Below zero again tonight. Monday, June 11th. The sun was at its brightest late this afternoon. Burning and shining away, but not giving much heat. With a risk of frost at hand, Father Clovis covered some of the apple trees’ branches this evening; and hoped. Tuesday, June 12th. Father Clovis was out early today, spraying the apple trees with water. This is a trick orchardists use, he says. It can prevent the buds from being damaged by the cold. Kind of wakes the buds up, I guess. The trees made out alright. Brother Leo was summoned to his family doctor’s office today for his bi-annual nonagenarian’s checkup. Physically things are good and the doctor was unreserved in his praise, saying that Léo is a walking, talking medication for people. Wednesday, June 13th. In Chapter Dom Innocent talked about how criticism can make us flower and grow, despite its being unpleasant. This morning he went to a meeting in Moncton, while Brother Stephan met with someone near the coast regarding the future of our forest. We have 1200 acres, 350 in fields, the rest forest. Thursday, June 14th. A single cat was walking down the road, and its gait suggested a) that it was bursting with life and b) not happy; the cat seemed to be revising its plans for the day, all the while struggling to believe that for her it could be necessary: rain. Big rain. Later, Mrs. MacDonald’s Grade 5 class rolled up in a big yellow bus, for a tour of the monastery. It was their day out, lunch in Rogersville, end of year, almost. Very sharp kids, and nice. There were highland dancers among them, who executed a thank-you dance before re-embarking. We spoke about the dairy farm, what it was like to be around big animals. I said how authentic animals are when to my surprise the kids chimed in with a slogan they’d learned in school about imitating what is best in animals’ ways. Friday, June 15th. We learned this morning of the death of Father Innocent’s father, in Nigeria, and prayed for him and all his family. Saturday, June 16th. Innocent has found airline tickets home for the funeral next week. The best he could find includes a very long layover in Montreal on the way home. Sunday, June 17th. Brother Stephan started work this week on a new barrier at the main entrance to our cloister. The old sliding gate, electronically controlled, has been out of commission for a few years. 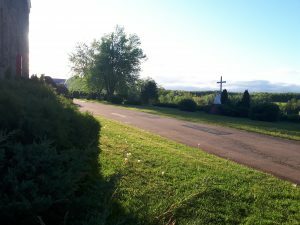 Light-hearted and usually quiet visitors have taken to strolling in and along what is in a sense a nicer part of the property, within the monastic enclosure; kids sometimes happily cycle through as though they were in a national park. Tuesday 19th. Brother Léo saw both Joe DiMaggio and hockey star Gordie Howe in his dreams last night. He wondered if there was a hidden message to the dream. Gordie Howe left a bigger impression around here than did any other NHL old-timer. Wednesday 20th. A young person is here from Montréal. Listening to his experience and perspective, I realise the Church really is finding its new face. He attends weekday Mass at the Monastic Community of Jerusalem (‘monks in the city’) in Montreal. Thursday 21st. A red extension cord is winding down the staircase from the music room. Its end is lit up, it’s kind of pretty. The music room, directly off the chapel, is where the record player is, along with hundreds of LP’s, most of them left to us by Brother Anthony Opisso; a harmonium, Dom Innocent’s guitar, a ragged piano which cannot be fully restored; CD’s other than the ones most listened to. Friday 22nd. From the scriptorium seats, you could see an odd-looking farm vehicle go by in the distance this evening. Not ours. Having folks farm so near by, using our barn, our fields, is a bit like something from a science fiction movie. Closer by, our main barn lays empty and the noise and motion and striking figures of summers past are gone. On the one had, it is as though the various buildings (including the monastery) have a new chance to breathe. On the other hand, things are just more ordinary. Saturday 23rd. I went to hand out bursaries at the High School Graduation today. Vital, close-knit culture is still in evidence; and today’s grads seem to have acquired a higher level of personal formation than did those of only a few years back. Thinking for yourself responsibly seems to be becoming ‘in’. Sunday 24th. Saint John the Baptist. Simone made us surprise bacon and cheddar muffins for breakfast, this special day. Mmm. Monday 25th. Sounds from the third-floor corridor indicated Father Bede is back from his month in the UK. He looks refreshed, and is happy both with his stay at Whitland, and the way his travel went. While at Whitland, he was able to see new faces, juniors from the UK region, as well as familiar faces not glimpsed in a while: Tarrawarra’s Michael Casey. Tuesday 26th. Fresh produce from our greenhouse was used for the spaghetti sauce this evening. With the arrival of summer, various windows are opened, bringing fresh air to the Chapel especially. Wednesday 27th. Brother Glic says it was extremely hot in the greenhouse today. Under the June sun, Brother Henry made his annual stop at a specialist’s hospital clinic in Moncton today. By now the doctor is an old friend, issues are few, and the nurses have changed to a new generation. Thursday 28th. The electronics for what will be the new cloister gate are making a tiny light in its box at night. For now, the bar for the gate is poised at 12 o’clock and held in position by cords. This evening Dom Innocent stepped back in from Nigeria, and that is all our voyagers back. Friday 29th. A little mild, a little cool; rain then no rain, wind then no wind and today in a calm moment outside, little moths appeared I hadn’t seen before, flying gently around. Saturday 30th. Dom Innocent is preparing to transfer our first ever grape vines from the green house to the garden. John today was cutting some plywood in the carpentry shop, for our coffins. He was talking about our late handyman, whose shop it was, and who’d built coffins, too. Plus choir stalls. Plus renovations. Plus, a great guy.